The Government has formally approved the restructuring of English Heritage into two organisations. A new charity keeping the name English Heritage will run the collection of historic properties and a new body to be called Historic England will champion the wider historic environment and provide support for stakeholders in the heritage sector. Full details of the Government announcement can be seen here and the English Heritage response here. Civic Voice has welcomed the Government announcement and the decision to invest £90 million in the National Heritage Collection of 420 historic sites, monuments and collections. The Civic Voice press release can be seen here. The Civic Society held its annual members evening on Thursday 10th October when members and friends listened to a fascinating talk about Marple Lime Kilns by Norman Redhead who is the Heritage Management Director, Greater Manchester Archaeological Advisory Service. An archaeological investigation of the Lime Kilns is part of the £1.5m "Revealing Oldknow's Legacy Project" that will investigate the archaeology of Mellor Mill and improve access to, and stabilise, Marple aqueduct. Norman explained that the project will concentrate on the the latter two sites but the proposed work on the Lime Kilns could lead to a more extensive project in the future. Preparatory work clearing vegetation, making an accurate photographic record and mapping the site with Ground Penetrating Radar has already been carried out. Future work will include a "Community Dig" and the installation of interpretation boards. It is envisaged that by the end of the project a "Friends" group will have been set up to help preserve and promote the Lime kilns. At the end of the talk Fiona Turpin, Project Manager for the "Revealing Oldknow's Legacy" project gave a brief description of her role and took part in an informative question and answer session. 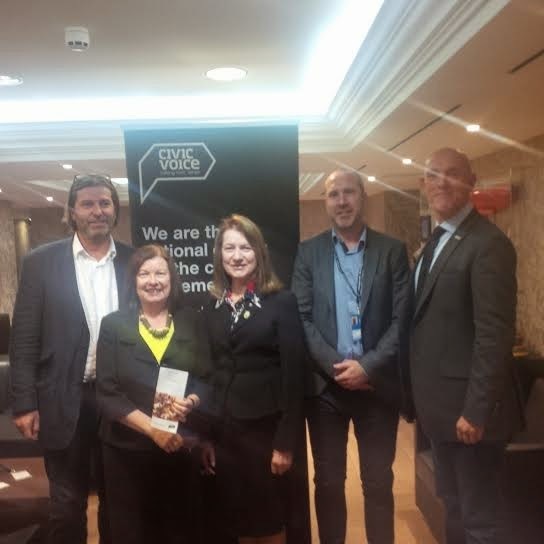 Civic Voice has appeared at fringe events at both the Labour and Conservative party conferences to publicise it’s commitment to increase public participation in the planning system. Entitled “How can we give communities a greater say in the planning system” the events were an opportunity to tell the story of the movement, argue our case and seek to persuade members of every political party of the importance of our agenda and manifesto. A panel of leading figures in the field attended the meetings including: Max Farrell of Farrell Consultants - author of the recent Farrell report, Justin Griggs - Head of Policy Development, National Association of Local Councils and, at the Labour Party fringe meeting, Roberta Blackman-Woods - shadow Planning Minister. Marple Civic Society was represented at the Labour fringe meeting by Alan and Gillian Postill. Gillian told the meeting that Marple faced multiple challenges including 2 new supermarkets, a substantial housing development and a wholly unacceptable road traffic scheme adopted without consultation. Gillian asked how we in Marple could persuade our council (in Stockport) to adopt the inclusive, multi-professional approach to modern placemaking recommended by Max Farrell and others on the panel. Panel members urged us to consider the adoption of a neighbourhood plan and/or a parish council for Marple if the current local politicians (councillors) and Stockport council are unwilling to adopt this approach. The society's annual social evening will take place this Thursday, 9th October 2014 at 7.30 in Marple Library. Norman is well known for his work on archaeological projects and community digs throughout the borough including those in Marple and Mellor. He returns to Marple to lead the archaeological project at the Lime Kilns as part of the HLF funded 'Revealing Oldknow's Legacy' project. Due to an unavoidable delay in the Oldknow project getting started, it hasn't been possible to carry out a community dig this summer as hoped. Nonetheless, English Heritage funded survey works and research have been completed leading to a better understanding of this Scheduled Monument. Do come along to find out more about the Lime Kilns which are now getting the attention they deserve after many years of being boarded up, out of sight and prey to the elements. Join us for a glass of wine and what promises to be an exciting presentation and congenial evening.